Why should you trust Able Moving & Storage with your international move? Because the United States Department of State does! 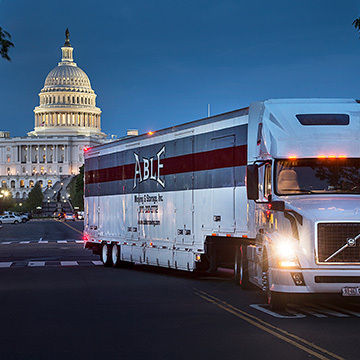 Since 2009, Able Moving has been a trusted service provider for the Department of State, responsible for moving employees in and out of Montgomery County MD, the Washington, DC area as well as from post to post all over the world. Able Moving’s International movers work hand in hand with our partners throughout the world to create the premier relocation experience. Because we are not confined to using a van line’s network of agents, we are able to select the best agent for service, pricing and communication. We know that moving overseas can be more complicated and risky than a local or long distance domestic move. Our international movers of Montgomery County MD truly understand how critical planning and attention to detail are to a successful moving project. Our primary goal is for you to feel at ease as you make your transition to another country. You can feel safe and comforted, knowing that every aspect of your move will be handled by our experienced movers from the initial planning stage, until to the completion of your move. We want your thoughts to be on the new adventure of living in another country — and not on how your belongings will get there. Able Moving is a full-service moving and storage company, and our goal is to provide efficient, prompt and safe release of your cargo at any destination in the world. Our international movers of Montgomery County MD will see to it that every last item is accounted for and handled with care. We can accommodate any moving requirement or need, no matter how complex. It doesn’t matter whether you are moving your home, your office, facility or your employees overseas, Able can handle the job with the efficiency and attention to detail it requires. I changed my moving date on short notice, so there wasn't a lot of time to get everything packed like I planned prior to the movers arriving. Good thing that didn't matter!! Your movers were polite, professional and amazingly efficient! I don't want to move again, but if I do, I will use your company every time!! I would highly recommend Able Moving & Storage to anyone. The movers and company staff were very professional and particularly sensitive to our needs. They arrived on time, packed and loaded our goods quickly and securely and wasted no time delivering our goods to our new home in another state. Because they know we understand the complexities of moving a family or business overseas. Unlike a local move or across the country, you will be entering an entirely different country which will entail a good deal of documentation before, during, and after the move. When you hire Able Moving and Storage as your moving company, you aren’t only getting trucks and moving professional, you are getting a complete logistical team to that will execute your move door to door.